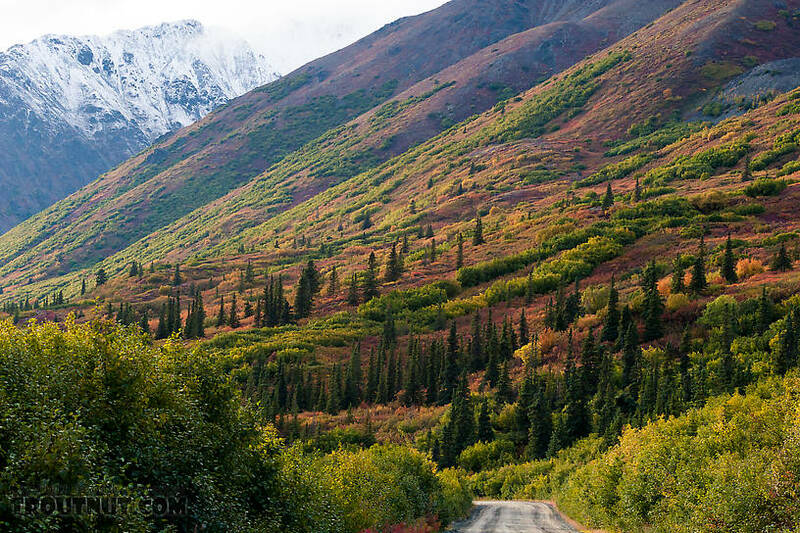 The Denali Highway winds along the southern flank of the Alaska Range between the tiny towns of Paxson and Cantwell. 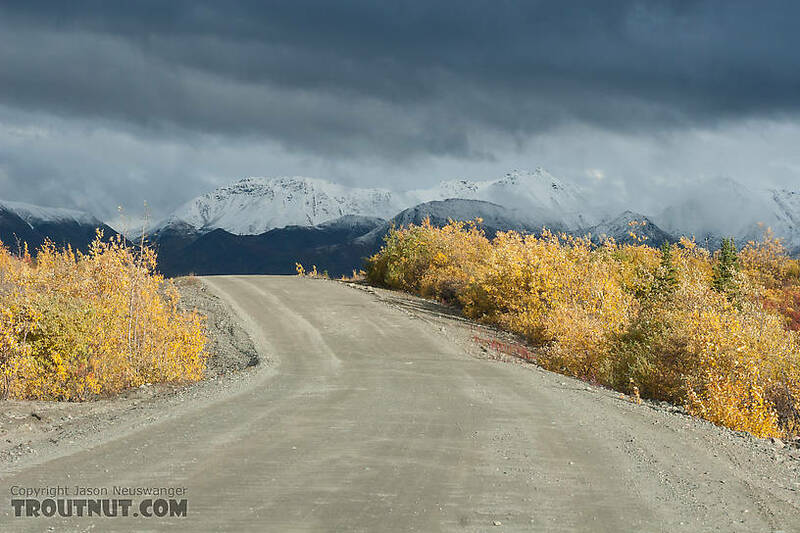 The 135-mile gravel road is flanked by 75+ miles of roadless wilderness to both the north and the south -- a land of towering mountains, large glacial rivers, and endless tundra supporting tens of thousands of caribou and other wild game. Arctic grayling and lake trout dominate their respective habitats, too, but they're safe during hunting season when all eyes are turned toward land -- even mine. With no red meat in my freezer, I left Fairbanks legally prepared to take any big game that offered a shot: bull moose meeting certain criteria, any bear, or any caribou. But I hoped for a bull caribou with a nicer rack than the one I arrowed four years ago on the North Slope. It's an easy mark to beat, but nothing is guaranteed in the boom-or-bust game of hunting migratory animals. When I tried this hunt last year, I struck out. This year I was more prepared, having endlessly considered last year's lessons, and having acquired some great new gear for a sheep hunt that I postponed until next year for work. Most would say I was over-prepared, because caribou hunts in this part of Alaska are often casual, and many bulls are taken near the road by hunters in jeans and red flannel. However, as in fly fishing, I enjoy meticulous excesses in my hunting, only instead of sitting at the fly tying vice trimming a fly's wings to just the right shape, I prepared by endlessly poring over topographic maps and gear lists. This hunt, I decided, would be a limited test of myself and my gear for next year's sheep hunt, a multi-day trip backpacking into the mountains as far as I needed to go. I shot him with my camera, saving my tag for a real hunt. As I approached the mountains I wanted to hunt, though, seeing fresh snow blanketing the high country sparked some doubt about my plans. 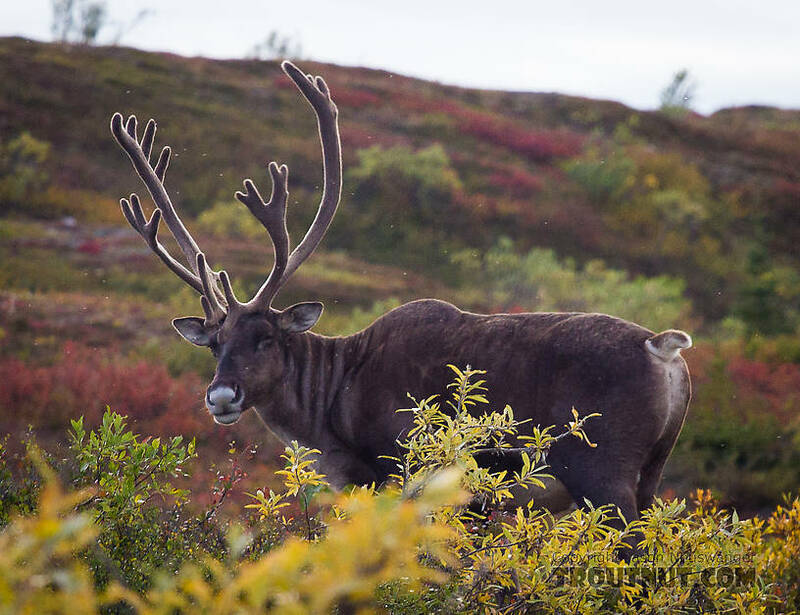 Might the snow have pushed the caribou down into the vast plains of scrubby willow and dwarf birch? 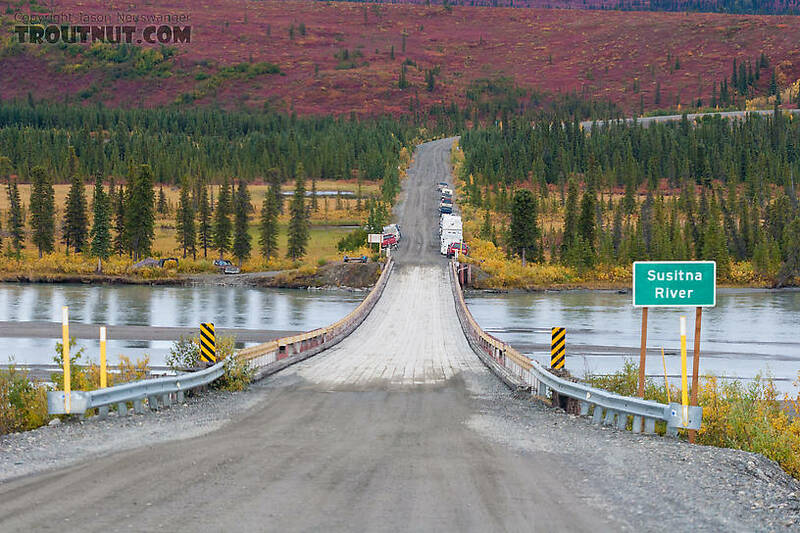 The Susitna River is one of the best access points to the vast wilderness away from the highway, so many hunters parked here and launched boats for long trips on the water. My hopes improved slightly as as I wound my way along the foot of the mountains and realized the snow line was still pretty high. I was still a little concerned about the weather, too. A pair of storms had recently blown in from the Bering Sea and buffeted south-central Alaska with hurricane-force winds and rain. I timed my trip--I thought--for the calm following these storms, but the weather wasn't all gone yet. I reached my hunting area with little time to hunt, so I focused on scouting, and drove to a vantage point to search the distant mountains with my spotting scope. You have to view this panorama full-size to appreciate the scale of the scene. I could not find animals to stalk this way, because the caribou, even at a lazy pace, would be miles away from where I saw them before I got there. But at least I could find out if they were still using the high country. In the fading light, I found one herd of about forty, four miles away moving into a high valley. 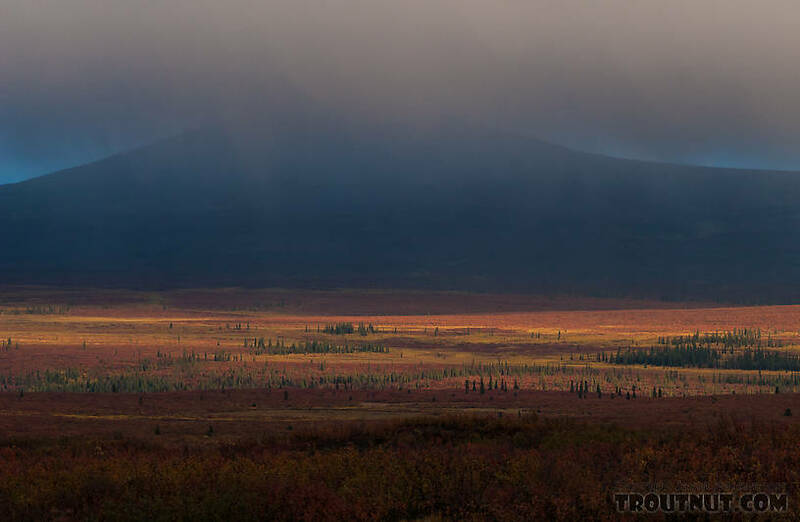 Six miles in another direction, a few caribou skylined themselves on a ridgetop above 4,000 feet. There was action up high, and I needed that boost to resist temptation when an opportunity many hunters crave fell into my lap. This cow moose was not legal to shoot, but the little bull with her was. 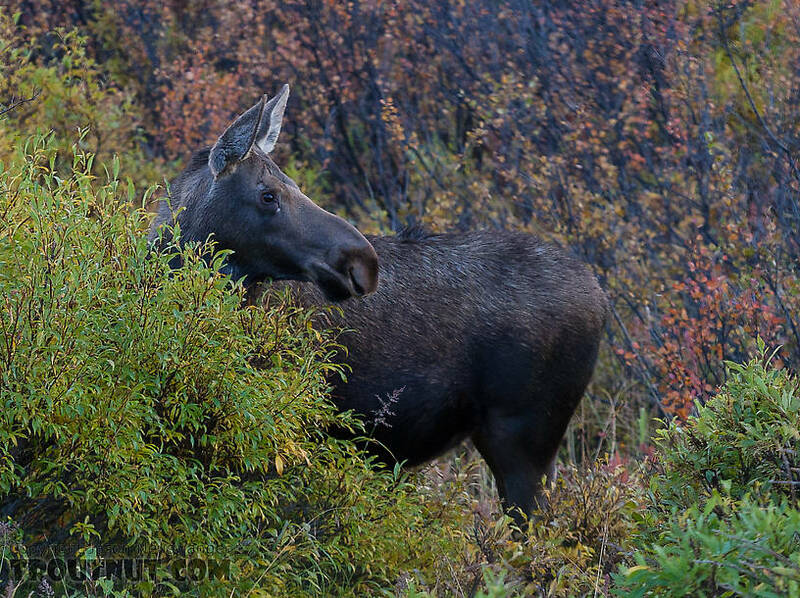 Just off the road were a cow moose (pictured) and young, spike-fork bull moose with a giant, flashing "shoot me" sign pasted across his vitals. Several hundred pounds of deliciousness were just a trigger pull away, as the stalk would have been trivial on these unconcerned animals. Not wanting to waste my preparation and forego my long-anticipated adventure in the mountains, I reluctantly drove away, wondering how hard I might later kick myself for passing up such easy meat, and what would have been my first moose. As darkness fell I stopped for a burger at the Alpine Creek Lodge, an oasis of great hospitality on one of the wildest stretches of road in Alaska. I told some moose hunters about the spike-fork bull I passed on, and I sensed some concern for my mental health, but I also found encouragement about my plan for the coming days. I camped that night in my car, ready to rise at dawn and hike into the mountains.